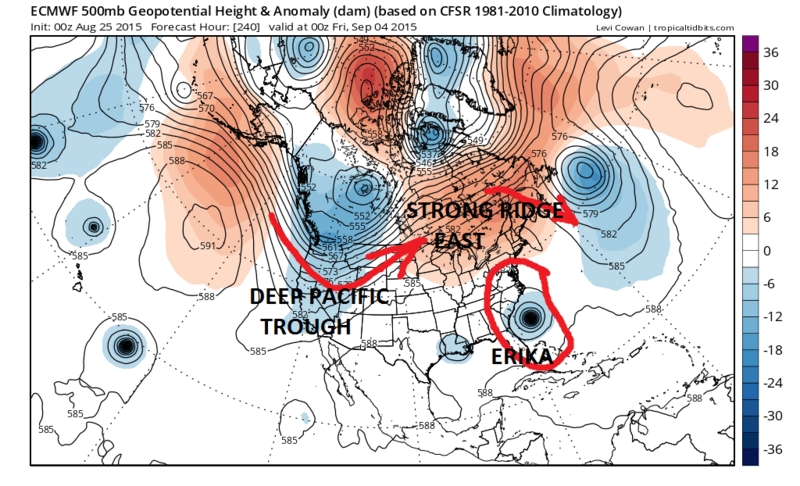 Let us address Tropical Storm Erika from the very top because it needs to be stated right from the word go that the forecast for Erika hinges on whether Erika suvives beyond 65 west. So far I have to say that i am not particularly impressed with this system as it appears pretty ragged on the satellite loops. Yes there has been a flare up of thunderstorms this afternoon in the northern semi-circle but the low level circulation appears to be on the western edge of the convection. There continue to be hostile environment issues across the Atlantic though not as extreme as when Danny moved through a few days ago. In the end there has to be a tropical system in order for there to be a tropical storm or hurricane threat and I would suggest that we simply wait a few days to see what we are dealing with before jumping into the deep end of the swamp. This was the European day 10 (omg yes day 10) solution from last night. 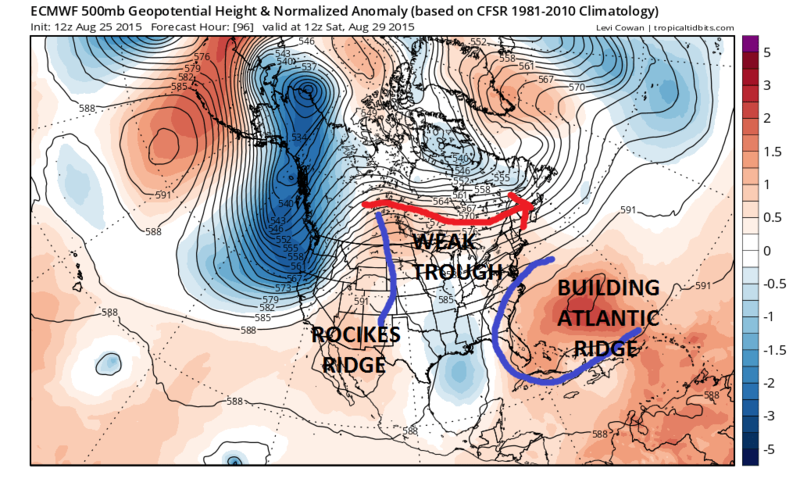 What the model did was respond to a rapidly building ridge off the Southeast Coast and into the Atlantic which builds east west from the Eastern US out into the Atlantic. Erika is shown here as a 944mb major category three hurricane sitting off the Southeast Coast of the United States. 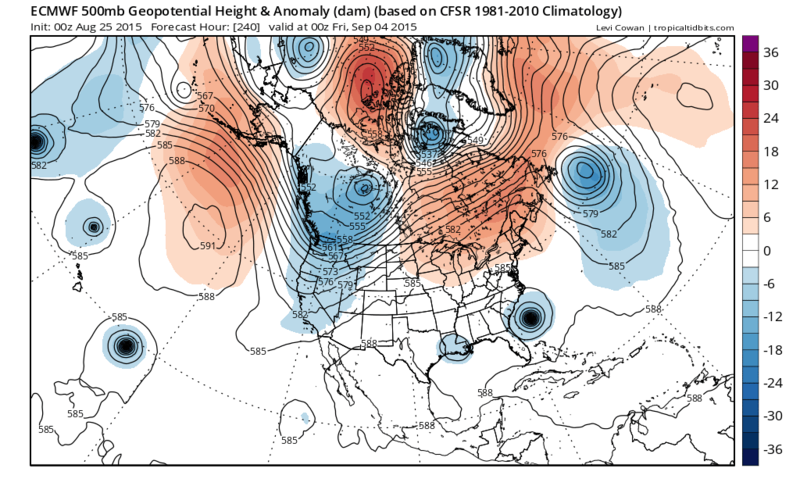 The European has an upper trough out in the Atlantic around 55 west which allows the strong ridge in the east and this shields the hurricane or tropical storm Erika from moving east and instead forces a track westward or west northwest along the coast…HOWEVER and this is a big HOWEVER…let us look at the GFS from this afternoon for the same time frame. The new day run of the GFS has the trough in the west however it responds differently to things in the east and forms a deep trough along the east coast. 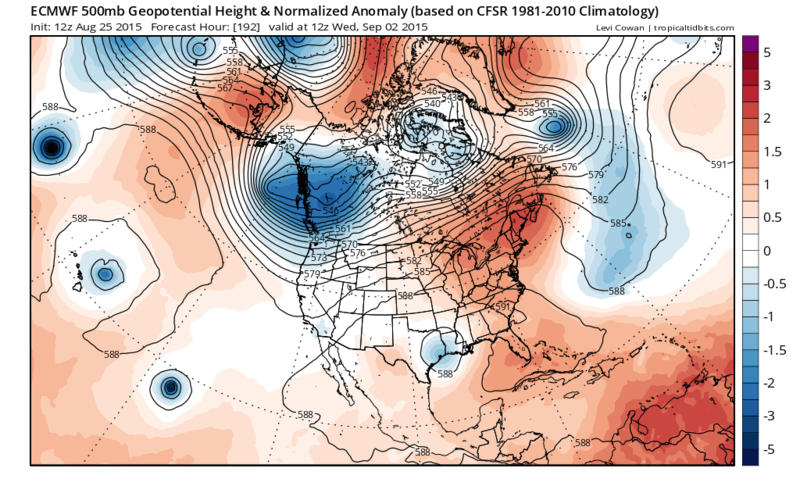 It also loses ERIKA comletely beyond the 48 hour time frame. You can barely find it on the surface maps! 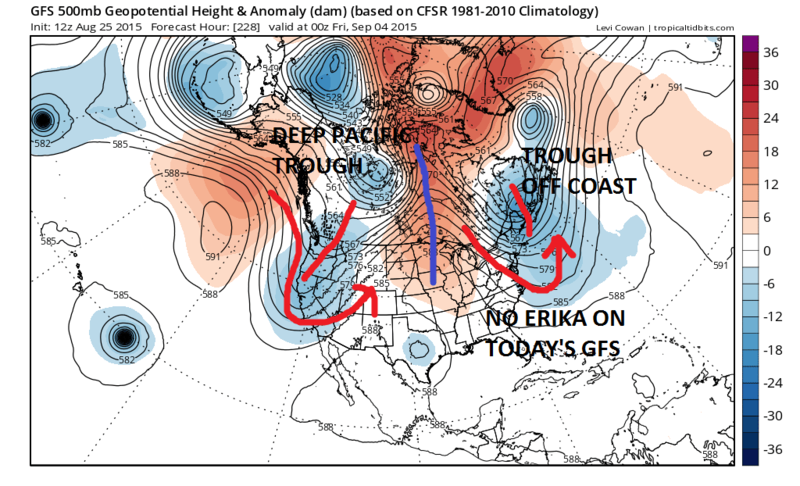 Either way if the GFS is correct even if Erika were to survive it would not wind up with that European major look from last night! A quick look at today’s European which is out to 192 hours doesn’t settle the argument about the troughs. Today’s run lend credence to last night’s European. 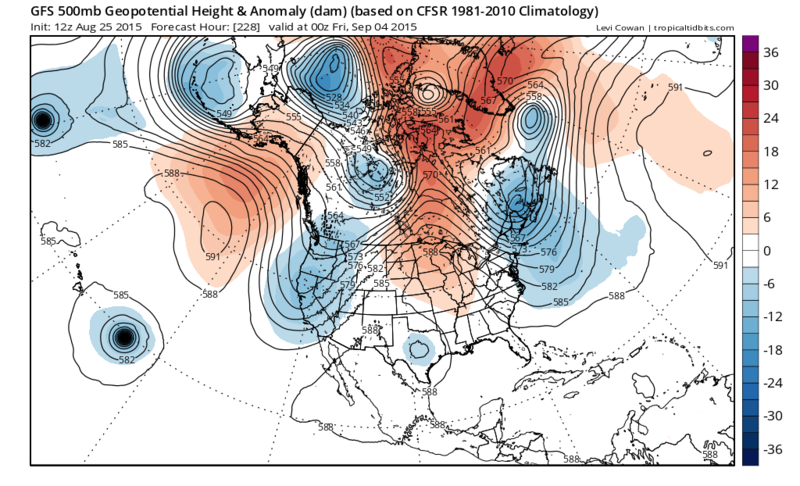 If you asked me to choose between the 2 models I would lean to the Europeans idea because the gfs with the deep Atlantic trough seems way out of whack to me and unlikely given all the energy piling in the west and the strength of the eastern ridge in general. 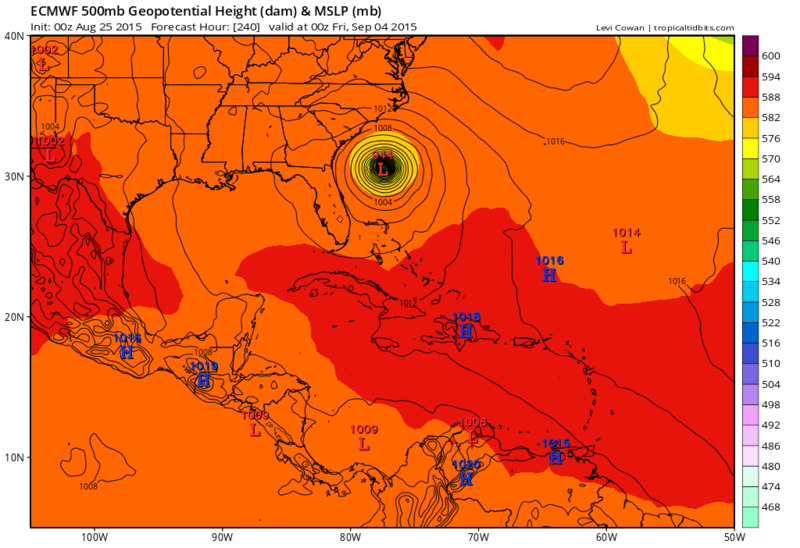 However the European does now join the camp of the GFS that questions the survival of Erika at all! 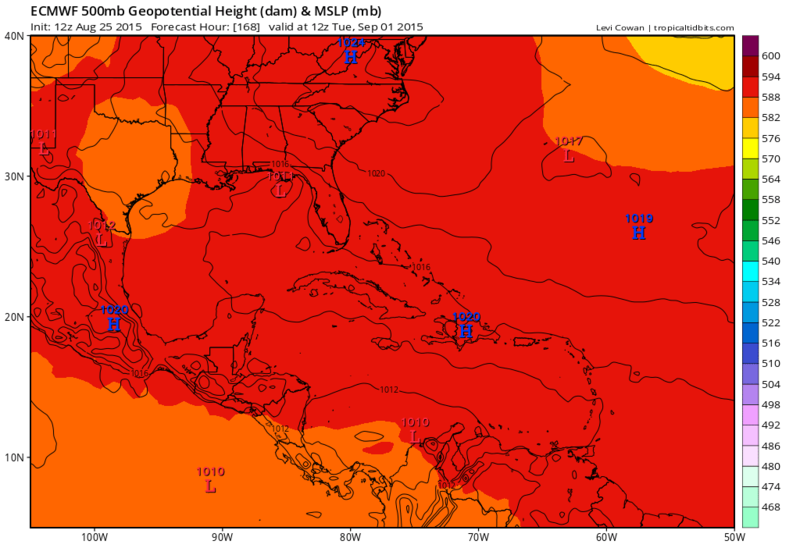 This is the European a week from Today and what is left of Erika is shown as a low in the Northwest Gulf of Mexico. 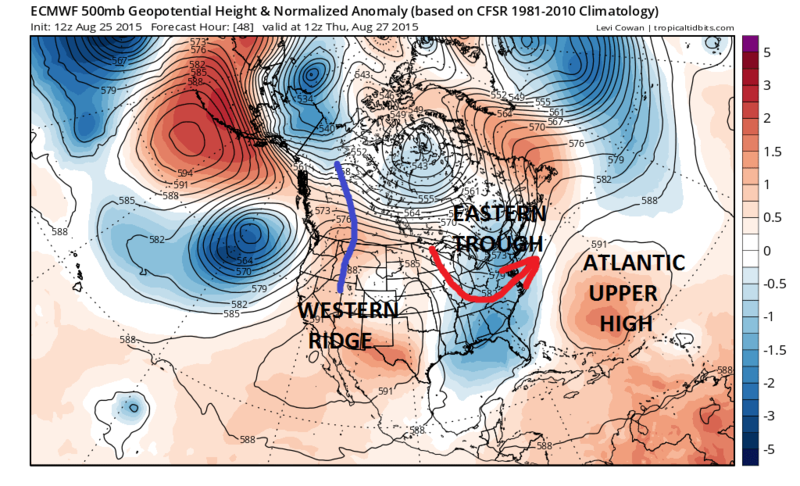 You can check the loop of this at tropical tidbits rather then me posting the whole thing. But unlike last night the European loses Erika beyond Thursday! The bottom line is that we can sit here all day long saying it is a threat, it isn’t a threat, it might be a threat. IT HAS TO SURVIVE PAST PUERTO RICO FIRST!!!!! And I will remind everyone that a weaker Erika will track more west than north and wind up taking a track south of all the spaghetti plot model forecasts that get thrown around on a system like this. At this point JOESTRADAMUS PUNTS! Could it be a threat? Sure but it has to survive first! Now with regards to our weather for the next 5 days or so. NO ISSUES. Dry and nice through Friday people! The trough in the east is bringing a nice dry air mass down from Canada. Temperatures will be near seasonal..nights will be comfortable. That trough is not going to hang around long because by 96 hours it is gone and the ridge is strongly rebuilding across the east. In the end this means that the weather here will be good through the weekend though I would suspect it will turn warmer and more humid over time beginning Saturday and into next week. But other than a minimal chance of a downpour or a thunderstorm it remains rain free here through Sunday. Certanly there is nothing for anyone to concern themselves with tropical wise over the weekend. If Erika doesn’t survive, there may be nothing to worry about at all. By the way it has been pointed out to me that it has been 117 months (nearly 10 years since Wilma hit the United States. Wilma was the last major hurricane (based on wind criteria of 115 mph or higher) to hit the United States. Im checking on this but that is a record dry spell when it comes to major hurricanes! Sandy would not be considered a major based on wind criteria.